The Pretty Polaroid Project is back! 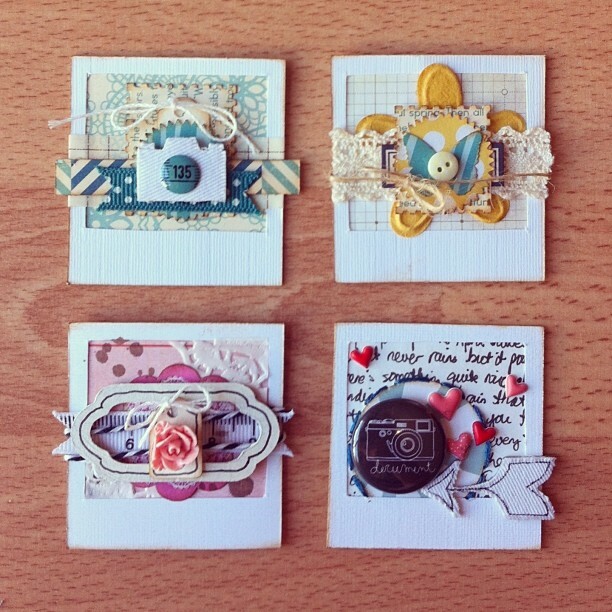 The idea is simple: in each new project post, I will share a step-by-step tutorial for making a little Polaroid-themed embellishment and then when they're all complete, I will share an idea for putting them all to good use. Allow me to run you through the thought process for this fourth little project. 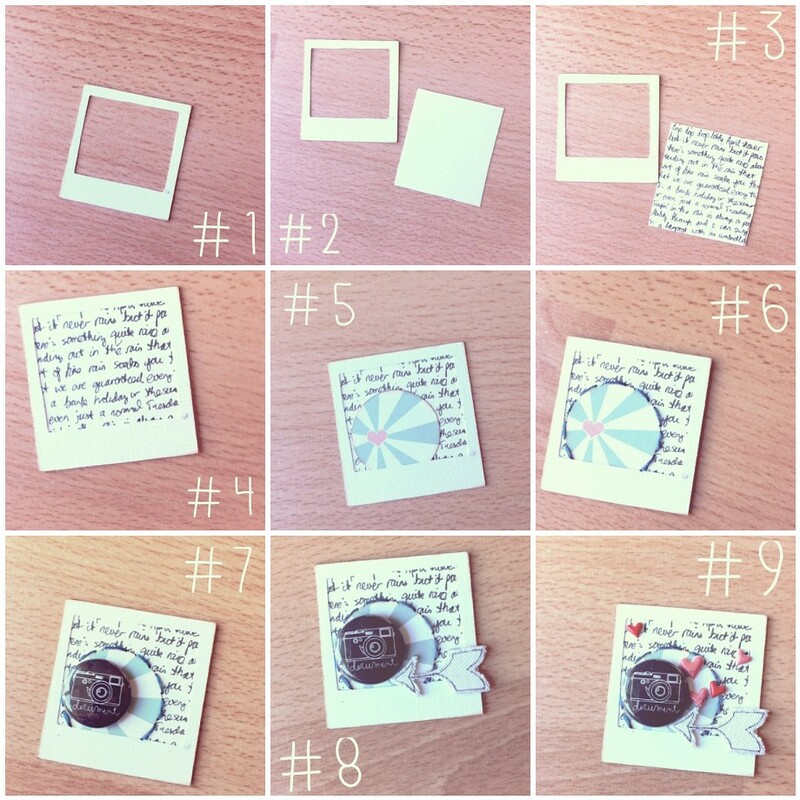 #1: cut out a Polaroid frame and #2: find a white background that will slot behind it. Before you stick it together, #3: cover the background in your handwriting. You can write nonsense (I did!) and it doesn't matter if it's legible as it's there to create design texture rather than being something to read. In #4: stick the background behind the frame and #5: add a circular die cut element. Anything will do; just a pattern or colour you like! For #6: outline the die cut with hand stitching and #7: add some flair! #8: sees us including an arrow to point to the important part of the design and finally #9: decorate with little hearts. Use whatever scraps you have lying around. Little projects like this are a great way to clear a cluttered table so if you don't have flair and arrows you could just as easily use brads and washi tape. Finally, if you'd like a copy of the polaroid template I use to make each frame, scoot me an email to the address below and I can send it on to you. I know I'm a little behind with these and some of you have requested the template and not heard back yet. But rest assured, don't panic - seriously, stop panicking! - as I'm going to do it today. Fabcakes :D Hope you're enjoying a lovely weekend. It's so sunny outside and I'm enjoying a tea break in central London while I indulge in a bit of blogging. That's a fancy way of saying I treated myself to a huge lunch because it's my last weekend off before I return to school, and now I need to sit down until I can move again. I'm like a snake who's swallowed a small rodent whole and has to bask in the sun. Except I'm not a snake and I think I swallowed Mexico and I want to bask in a deck chair. With a cocktail. P.S. I am sticking to my 'Give Instagram a chance!' experiment and used my phone camera to put this tutorial together. The picture quality isn't as good as my beloved proper camera, but I think it's good enough for this and I kind of like the final effect. Any thoughts? I was really inspired when you posted the first three of these and used the idea on a couple of projects so I am very glad to see you back at it! So glad to see these back! ...and the pics look fab!